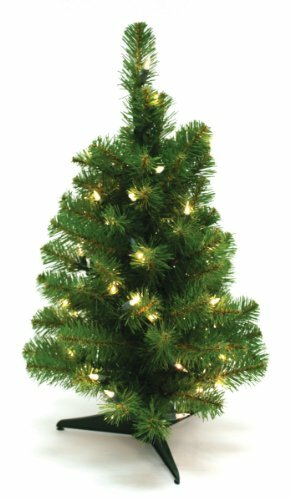 This artificial Canadian tabletop Christmas tree is 2-feet tall with a 16-inch diameter. It's prelit with 50 clear lights. It's constructed of hinged branches, so you don't have any lights to hang or branches to attach before decorating with festive ornaments. All 80 tips feature flame-retardant, crush-resistant needles that retain their shape through many busy holiday seasons. They resist fading, and their sculpted tips provide a finished yet natural look. The lights are UL approved for consumer safety. Comes with a 3-legged plastic stand.